Update 4/22 10pm: All the arrestees are released! They are in good spirits and feel supported by our collective solidarity. Further donations will go towards helping these and other protesters pay for lawyers to beat their bogus charges. Update 4/22 5pm: 11 out of the 12 arrestees are now free. One more to go! UPDATE 4/22: We have several protesters free already thanks to bail contributions! We have contacted everyone still in jail, and have learned some concerning things: Some protesters are being given trumped up felony charges, despite video evidence showing they did nothing. We believe the charges are intended to make it longer/more expensive to get them out. We have also learned that some protesters have been put in the same cell block as a Nazi. This makes it even more urgent that we get folks out as soon as possible. Please keep the donations coming! Nazis from the "National Socialist Movement" staged a hate rally in the Metro Atlanta area on April 21st. A diverse coalition of anti-racist activists protested the rally, but police violently repressed these protesters. 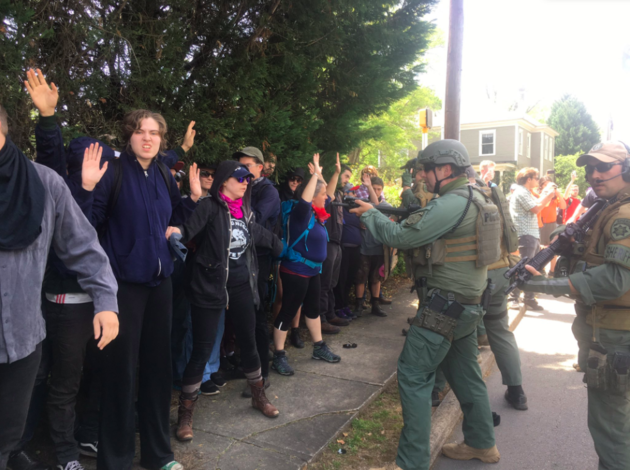 As feared, cops attacked and arrested people with absolutely no justification - particularly people of color and other marginalized individuals. So far, we're aware of up to 13 arrests, some of whom are dealing with serious medical conditions while in jail.